Quarterly results for the maker of Jack Daniel's whiskey were hurt following the sale of Southern Comfort. Brown-Forman has a flavor profile to fit every lover of Jack Daniel's whiskey. Image source: Jack Daniel's. Jack Daniels whiskey has always been a priority at Brown-Forman (NYSE:BF-B), but after selling its third biggest brand -- Southern Comfort -- earlier this year, the distiller really can't afford for its flagship spirit to stumble. Brown-Forman shares have already fallen in the wake of its most recent earnings report. The Jack Daniel's family of whiskey accounts for 55% of Brown-Forman's depletions, which include shipments sent directly to retail or from distributors to wholesale and retail customers, a metric that is commonly regarded as a proxy for consumer demand. Old No. 7, the original, most popular whiskey that most people call for at bars as simply "Jack", accounts for 55% of all brand depletions and 30% of the company's total portfolio. The next biggest brand is Finlandia vodka, which at just under three million nine-liter cases, represents 7% of Brown-Forman's total portfolio depletions. Southern Comfort was No. 3 with less than 5% of the total, but following its sale to rival Sazerac this past March, the distiller will be relying upon Jack Daniel's even more going forward (ready-to-drink mixes that are made with Brown-Forman's el Jimador brand of tequila account for 14% of depletions). Yet Jack Daniel's strength is also the company's greatest weakness. Jack may be the fourth largest premium spirits brand and the biggest selling brand of American whiskey in the world, but that has also made Brown-Forman essentially a one-trick pony that needs to continuously come up with variations on that family of products. Data source: Brown-Forman 10-K filing. Chart by author. So far the distiller has proven quite adept at doing so, first introducing its Tennessee Honey in 2011, and then Tennessee Fire in 2014, a cinnamon-flavored whiskey intended to compete with the popular Fireball brand from Sazerac. Last year, Tennessee Honey was identified as the 15th largest premium brand in the world, and together with Tennessee Fire, surpassed one million cases in the U.S. While that has been key for Brown-Forman -- the U.S. market represents nearly half of its total sales volume -- the whiskey market here, even as it has enjoyed some newfound strength in recent years, is mature. At the same time, a number of its other brands are coming under pressure in international markets. In its just-reported fiscal first quarter results, the distiller said emerging markets haven't stabilized as expected with underlying net sales falling 5% year-over-year. Fortunately, developed markets continue to perform well, even if currency exchange rates caused it to report lower profits. Moreover, the overall market and trends are in the company's favor -- premium and super-premium American whiskeys are in vogue both at home and abroad. The Jack Daniel's family enjoyed a 3% increase in underlying net sales while those of its Woodford Reserve brand of super and ultra-premium whiskeys surged 24% from last year. The brand finally reached 500,000 cases in fiscal 2016, and the distiller is looking to replicate the model with its Slane Irish Whisky that it calls its next big growth label and is expected to launch next spring. 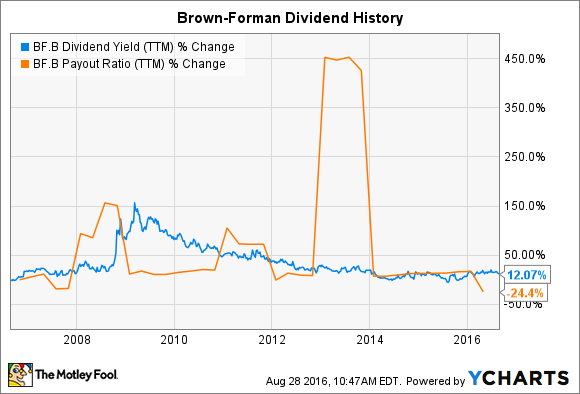 Brown-Forman should have no problem growing at above-average rates for the next few years, which means investors shouldn't ignore its dividend, currently yielding about 1.4%. The distiller has maintained a consistent payout ratio over time (the spike in 2012 was the result of a special dividend). Brown-Forman also enjoys good liquidity with comfortable cash balances, the ability to generate stable free cash flow (that is expected to grow in the next few years), and an untapped credit facility. Even with the sale of the Southern Comfort and Tuaca brands, along with the headwinds faced from foreign currency fluctuations, the markets have clearly developed a taste for Jack Daniel's in all its iterations. Brown-Forman stock may have traded down on its earnings, but investors with a thirst for profit may just consider that an opportunity to belly up to the bar.